We have not been able to identify this mill lodge in Bolton. If you can help us to identify it then please leave a comment below. the wooden ‘tower’ in the middle ground was located near Weston Street by the railway bridge and was part of a tannery there. It looks like the tower of the Beehive mill in the right background poking above the mill. At a guess this would place the photo location near Walkers tannery looking south. Although similar, to what Derek Preistland describes Humphrey Spender never strayed further than school hill area and the town centre, so I would suggest this is as described above mortfield/nelson/park mills area or possibly Atlas mills complex. 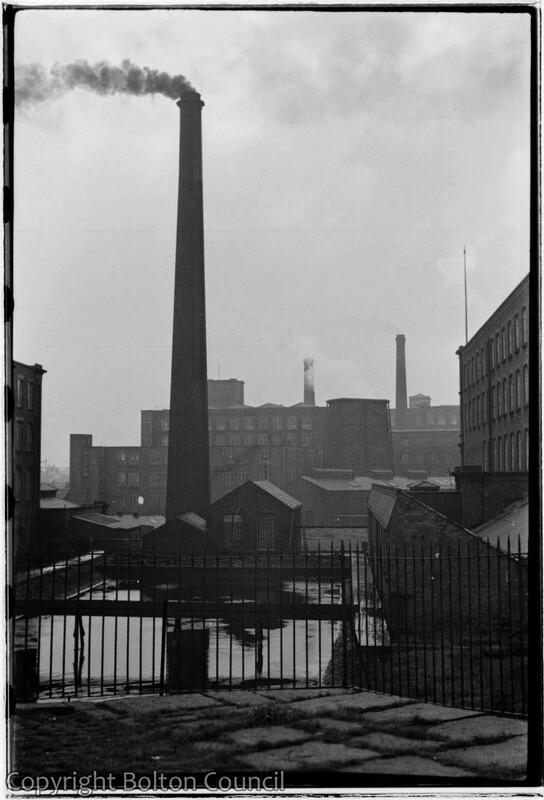 Looks like the back of Merehall Street/Mortfield with Nelson Mills & Park Mill; and there was a wooden tower like this one next to the ginnel which ran from Avenue Street to Gaskell Street.